We Have One of the Best Lunches Ever | Sprezzatura, Y'all! Food – do you get tired of hearing about it? I guess if you do you would have stopped reading a long time ago. Some people may think I’m obsessed with food. They’re not far off. I wouldn’t say it’s an obsession, but I would say that food is a central part of my journey through life. There’s more to food than satisfying hunger. In fact, that’s the least of it to me. Anything can sate your hunger – a peanut butter sandwich eaten alone at the kitchen counter fills your stomach up. But it doesn’t fill your soul. And that’s what food, and dining together, does for me. Breaking bread together – it binds us in a special way. It’s a ritual that we can all participate in. I also love to taste the food of truly great cooks. The way they put flavors together, the ingredients they use. Gifted cooks can make the simplest thing taste wonderful. Today we went to Sansepolcro and finished what we were doing just in time for lunch. We tried two different places that we had been to before and they were both closed. So we decided to try a new place that we didn’t know anything about. What a fortunate turn of events for us that the other two places were closed. Osteria il Giardino di Piero is just outside the ancient city walls of Sansepolcro. We walked in, with Millie, and thought, “Oh no, this is going to be expensive!”. It was a really nice place – nice lighting, beautiful table linens, the kitchen was incredible. But after a glance at the menu, we discovered the prices were not much higher than a regular trattoria. I think the most expensive thing on the menu was 12 euro. We had two amuse from the chef to start – I love free gifts of food! The first was a house made capicola. The second was a couple of crostini (little bread toasts with spreads) – one was the Tuscan favorite of liver, the other was a white crostini with butter, anchovies and capers. The capicola was great – flavorful pork with just the right amount of fat (because you have to have fat). I tried one of the white crostini, with the anchovies, but it was not my favorite. Steve had already ordered this as an appetizer before we found out we got a little gift of it. Good thing he liked them so much! I had pumpkin ravioli with ricotta and nuts. The ravioli were stuffed with a delicious pumpkin mixture and were served on a ricotta sauce with chopped nuts sprinkled over the top. It was a taste explosion. Although my pasta teacher, Rosella, says true ravioli is only stuffed with spinach and ricotta, this was quite good. See, this is what I love. Taking these ingredients and making them all work together so that they are all in perfect harmony. You really don’t taste one thing, you taste the combination. I also had a salad that was so simple but so incredibly flavorful. Fennel, oranges, and pomegranate seeds. A little drizzle of olive oil and balsamic vinegar. What freshness! It was like eating sunshine. Steve’s meal was a thing of beauty. If you’ve ever eaten with Steve, you know that he eats a lot. He usually orders something from every part of the menu, or at least a couple of them. This meal, he kept a menu on the table and just ordered more after each course. He started with the crostini, then he had crespelle with spinach and ricotta. Crespelle are crepes, and these were fashioned into little bundles stuffed with spinach and served over a ricotta sauce. It was beautiful and wonderful. Then he ordered veal roast and it was served in a beautiful white tureen with a fabulous sauce and slices of bread because they knew you’d want to sop that sauce up. Then we shared a cheese plate with acacia honey and house made green tomato marmalade. 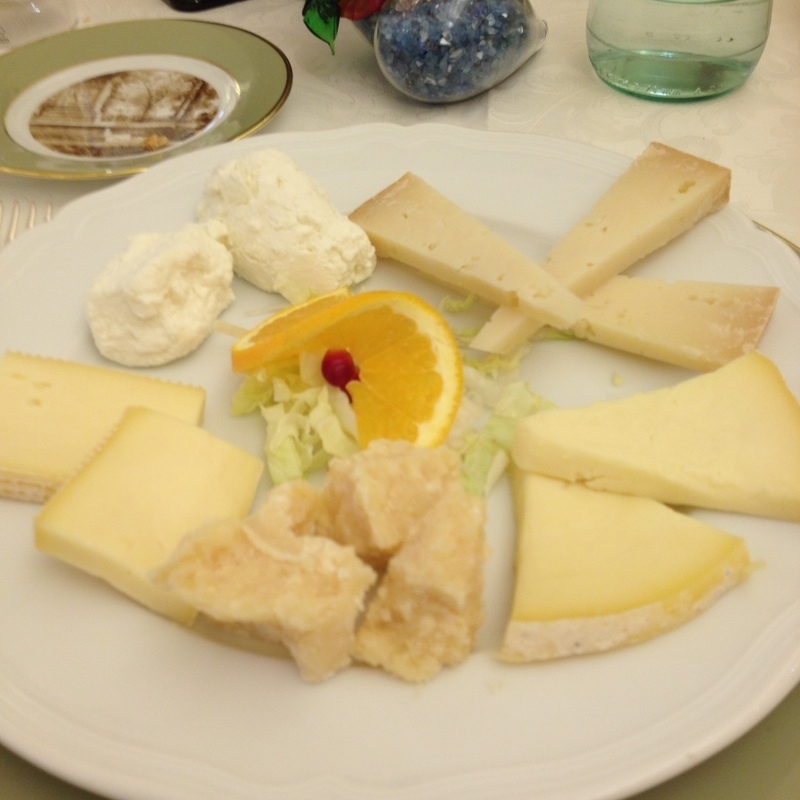 If there’s anything better than cheese at the beginning or end of a meal, then I’ve never had it. And the addition of honey and marmalade is brilliant. The green tomato marmalade was fantastic. It had a perfect blend of sweetness and tartness to go perfectly with the cheese. 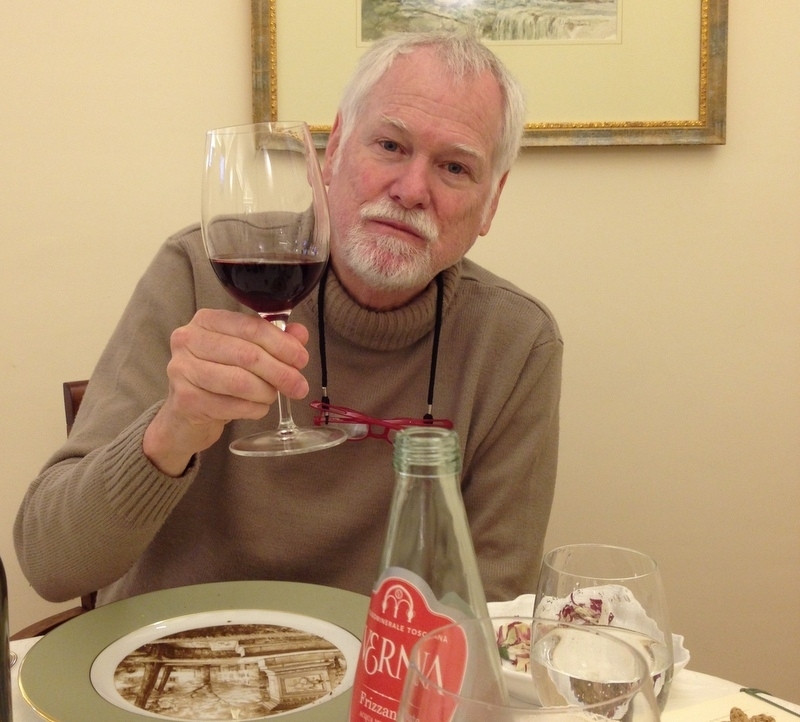 We had a great bottle of Chianti and a fabulous time. Lunches like this are treasures. They’re unexpected and special. They’re the kind of things you remember long after you’ve forgotten if you saw the David before or after the Birth of Venus. I suggested to Steve that in the three weeks we have left, we do this every other day. Every day is too much – it’s not special anymore if it’s routine. Realistically, every other day is probably too much, as well. Maybe we’ll shoot for four times a week. That’s twelve more lunches. A dozen. Maybe we’ll throw in a dinner or two – just for good measure. Im full just reading this description of all the delicious italian specialties. Cathy, you are my soul sister in eating… My sentiments exactly! Sounds like an incredible way to spend a few hours!